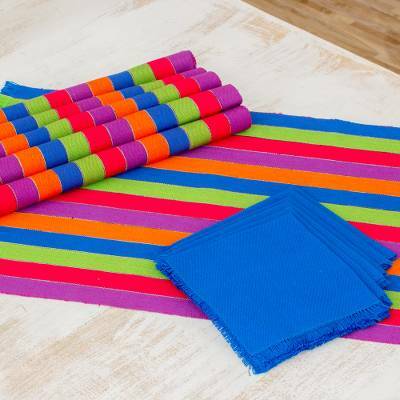 Six Multicolored Striped Cotton Placemats and Napkins, "Harvest Trails"
You can find cotton placemats and napkins 'Harvest Trails' (set of 6) by Eladio Chiroy in tableware categories such as Hand Woven Table Linens, Cotton Table Linens, Placemats Table Linens and Napkins and Rings Table Linens. Enjoy exploring these sections for other Novica treasures. He is helping his youngest son finish his studies. Eladio uses a handloom to create his textiles. He was taught by his father at a young age and he recognizes its importance to Guatemalan culture and history. Before he started weaving as a NOVICA artist, he was a school teacher and kept a handloom in his classroom so he could teach any students that were interested in weaving. Eladio and his work have been featured in several books. My daughter received these mats/napkins as a gift and loves them. the workmanship is excellent. The fabrics are bright and used skillfully to create useful items displayed with pride.